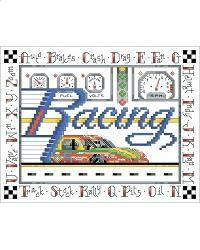 All things fast for that race car fan in your life. A quick stitch as fast as that race car. One of our most requested designs for boys or big boys who love racing! The alphabet describes all things race related. vroooom! Project Size: 98w x 7h"